Everyone seems to be obsessed with money these days, as if it solves everything. I heard on the news last night that the 3 richest Australians have more money than the bottom 10% of the nation. Pretty shocking! It’s a shame that there isn’t a way of making life a little bit more even and equitable for the disadvantaged. The Lovely and I have done very well for ourselves, being able to have built a simple, largely non-aquisitive, organic lifestyle here, without ever having had a ‘real’ job. We’ve managed to ‘get away with it’ for all this time, living an engaged, creative, self-employed, part-time amalgam of a life. Without credit card debt or interest payments, doing almost everything ourselves. Living within our self-determined means. We’ve never been on the dole and never asked for handouts. Money may be essential in the modern world, but we don’t let it ruin our lives. I think that money is a like a tool. You pick it up when you need it to do a job, and it’s so much easier if the have the right tools at hand. Then you put it down when the job is finished and don’t think about it again, only taking care to make sure that it is well looked after while not in use. Having tools that you don’t use is a useless waste, better that someone else who needs the tool should have it and get good use of it. That is how I believe that it should be for money too. I think that a lot of people have too much ’stuff’ that they don’t appreciate or really need. Probably bought on hire purchase or credit card debt. We’ve made a point of avoiding that as much as possible. When I’m fasting, I really appreciate a glass of water. It tastes delicious, I’m so happy to be able to drink it. Such a simple pleasure – and so rewarding. When I get to eat that first small simple meal after the fast. It’s really appreciated. I’m so grateful to be able to eat some small simple thing. A salad, a piece of fruit, some steamed vegetables. They are so wonderful, because of my self imposed state of self denial. Everything is relative. In the 5 days between my fasts, when I’m well fed. That same glass of water isn’t very interesting. A glass of wine seems to be so much more appealing with a nice meal from the garden! Fasting isn’t just about food. The controlled, personally-imposed state of self-denial is a state of mind that applies to money and posessions, just as much as it does to food. When we began to live without a lot of money to pursue our artistic dreams, it was a kind of self-sacrifice. To get the time to make art, we had to forgo paid work. After we had survived like this for long enough, We started to realise that we just didn’t need so much of it. Not buying, renting, or serviceing the loan repayments on ’stuff’ saved us loads of money, to the point that we just didn’t need to go to work every day any more. This is how we have found the time to make pots – but we still needed money. It all changed when we bought our house. It’s pretty clear that you can’t save up enough money to buy a house outright, so we borrowed money for that, just like everyone else, but not since then. We built nearly all of our house and workshop ourselves, over time, paying for parts and materials as we needed them. I did nearly all the trades, except the electricals. Making everything ourselves. It saved us a fortune. We built the house for the cost of the materials, about $25,000 and the workshop for $4,500. We have managed to live most of our lives without debt. We keep our cars for 10 to 15 years. We save up and buy them when it’s needed. I do all the serviceing and maintenance myself, and by doing all the repairs and maintenance around the house and property, we end up not spending very much money at all. It’s a badge of honor to keep the 40 year old kitchen stove repaired and working, as well as the 25 year old lawn mower, the 22 year old washing machine and the 15 year old truck. I’m not so nieve to think that everybody should life their life this way. I’m not recommending it. It’s suited us and we have been very successful living this rich rewarding life. I think that money is certainly very useful stuff, but the cost of earning it is very high. I have to give up all the things that I really prefer to do to stop and earn money. So, once the basic minimum and a slight little extra for security against the the unexpected is earned and achieved, then it’s time to stop earning money and take time off to do something much more interesting and rewarding. In our case that something is gardening and making pots. Gardening doesn’t earn us any money, but it saves us from spending some. Pots don’t earn very much money, but the returns on investment are exponential, if measured in satisfaction and enjoyment. We don’t have much in the way of superannuation, but I have spent the last 25 years, laying aside special batches of clay whenever I could. This is one peculiar type of super. However, It would be worth a lot more if it were red wine and not clay! At 64 I realise that I will not be able to lay down clay for anther 25 years, as I have done in the past. I can’t see myself still being here when I’m 90! I spent the afternoon working up and then throwing some of my oldest porcelain body, made back in 1990. The kneeding of the rather hard paste was a lot of effort. It needed wetting down a little and then re-working, that really mucked up my wrists for the rest of the day. I have other batches of my milled stone pastes that date back 10 years and more. I get them out every now and then and try some of it out all over again. Just to see how they are improving. Slowly whittling away at the original dozen kilos, that I first stored away in these plastic packs. These non-plastic pastes are so much better with a few years of age under their belt. It’s amazing how a little time can cause such a great change in the rheology of these finely ground mineral coctails, and time is cheap anyway. It cost me nothing to leave it there – especially when I was younger! Now that I’m not in a position to take advantage of the cheap option of time any more. I’m making use of some of the banked age that I have been accumulating in my clay store over the 40 years of our time here. This is now the time to make withdrawals from my clay bank. I have been slowly working away on a special project for the past decade and it’s starting to come together now. I’m feeling pretty good about it. Perhaps in another year or two, it will result in a nice show of special work? 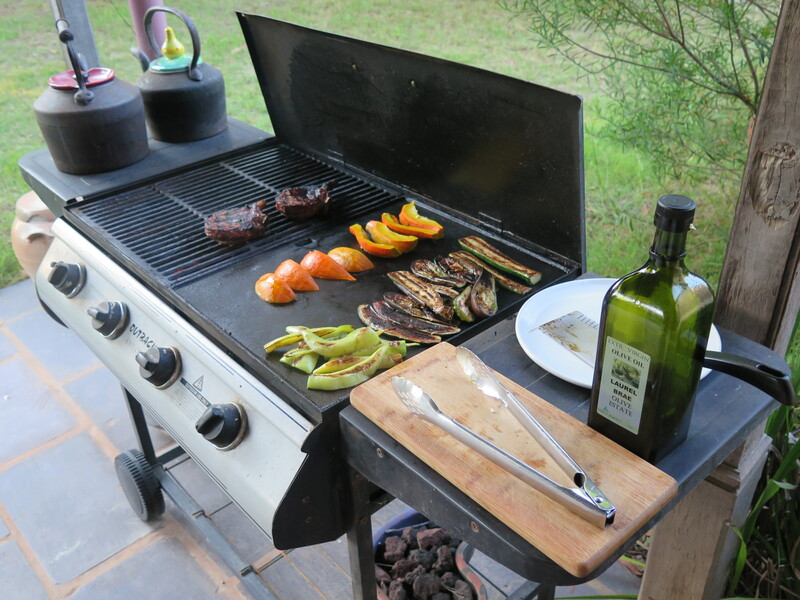 We decide that it would be nice to have this months red meat meal tonight, so I BBQ a couple of choice eye fillet pieces with the bone on, along with slices of zucchini, aubergine, capsicum and trimmed orange pumpkin slices with the skin on. We have been growing these marvelous little orange gems all summer. They have been so prolific that we have taken the majority of them to our son’s restaurant as we can’t deal with them all by ourselves. There are just so many of them, we are harvesting 3 or 4 of them a week. These things are so tasty and delicious when BBQ’d. It’s a lovely evening, our visitors have left and we rejoice in the tranquillity of the sunset and our time together as the air cools and settles. 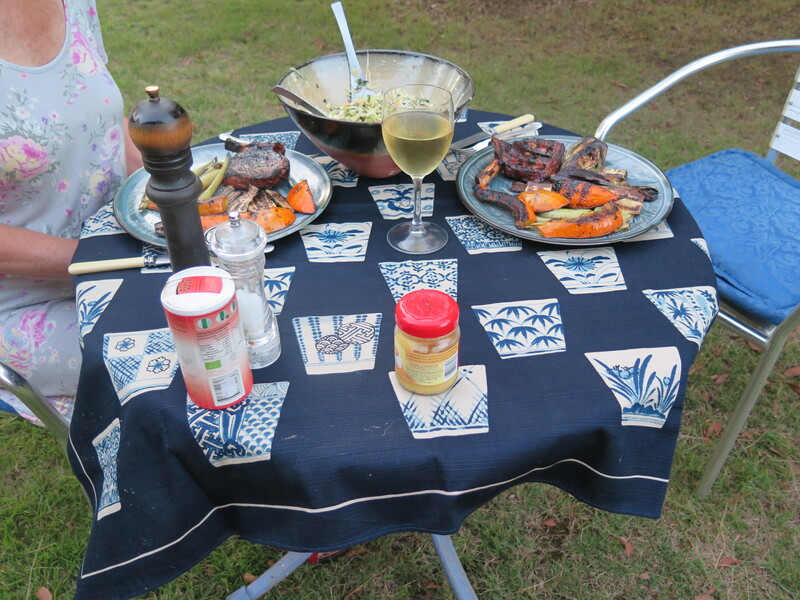 We move the table out from under the verandah and on to the lawn, where it is cooler. I do the BBQing while The Lovely finely slices one of our cabbages to make a sort of coleslaw salad, except that it develops as she goes along, adding chillis and shiso leaves and an Asian inspired dressing, using vinegar, soy sauce and sesame oil. Suddenly its all changed and becomes something else, quite exciting and interesting. No mayonaise in sight! I love being able to eat the dividends of our investment in our garden in this way. In so many ways it’s better than what money can buy. It’s all organic and super-fresh. We couldn’t afford to eat like this if we were buying it or going to restarants and eat out. This entry was posted in clay making, cooking, self-reliance by hotnsticky. Bookmark the permalink.